Giordano Bruno and the Geometry of Language brings to the fore a sixteenth-century philosopher's role in early modern Europe as a bridge between science and literature, or more specifically, between the spatial paradigm of geometry and that of language. 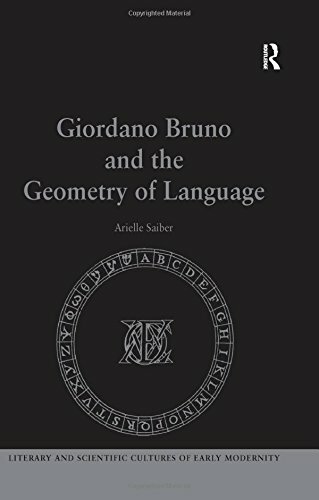 Arielle Saiber examines how, to invite what Bruno believed to be an infinite universe-its qualities and vicissitudes-into the world of language, Bruno forged a system of 'figurative' vocabularies: number, form, space, and word. This verbal and symbolic system in which geometric figures are seen to underlie rhetorical figures, is what Saiber calls 'geometric rhetoric.' Through analysis of Bruno's writings, Saiber shows how Bruno's writing necessitates a crafting of space, and is, in essence, a lexicon of spatial concepts. This study constitutes an original contribution both to scholarship on Bruno and to the fields of early modern scientific and literary studies. It also addresses the broader question of what role geometry has in the formation of any language and literature of any place and time. If you have any questions about this product by Ashgate Publishing Co., contact us by completing and submitting the form below. If you are looking for a specif part number, please include it with your message.